Israeli warplanes carried out on Tuesday morning sudden and intense mock air raids over Gaza Strip. 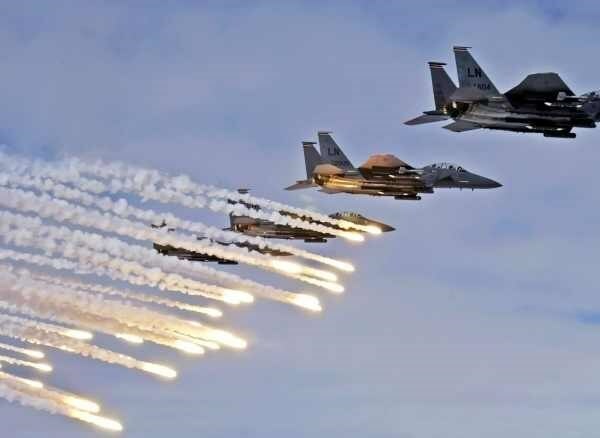 Quds Press said squadrons of Israeli F16 planes flied over the blockaded Gaza Strip and launched sudden and intense mock raids in the morning hours. Loud explosions were heard across the Strip, spreading fear and panic among residents, particularly children. The raids coincided with the commencement of the Israeli general elections. On July 7, 2014, the Gaza Strip was exposed to a large-scale Israeli military aggression that lasted for 51 days and killed over 2,311 Palestinians, mostly civilians. Thousands others were injured while thousands of houses were completely or partially destroyed. The Israeli Occupation Forces (IOF) opened their machine gun fire at dawn Tuesday at Palestinian fishing boats off Gaza shores, while a number of farmers were targeted in a similar attack. No injuries were reported during the two reported attacks on Tuesday morning. Palestinian sources told Quds Press that Israeli war boats opened heavy fire at Palestinian fishing boats while sailing in the permitted fishing zone. Due to the heavy gunfire, the fishermen were obliged to return to shore. No injuries were reported. In a similar attack, Israeli soldiers stationed at Gaza boards opened fire Tuesday morning at Palestinian farmers while in their agricultural lands located at the border areas. Eyewitnesses said that the gunfire attack coincided with unusual movements of Israeli troops along the border areas and heavy flights of Israeli helicopters over the area. Israel has routinely violated the Palestinian-Israeli truce agreement since it was signed on Aug. 26 that ended the Gaza war. Harassment of farmers and fishermen forms just a part of Israel’s continued violations of the ceasefire deal. The Israeli Occupation Forces (IOF) launched at dawn Tuesday military exercises in the southern areas of Jenin amid sustained flights of Israeli helicopters over the area. The PIC reporter quoted local sources as saying that IOF soldiers stormed Sanur site, a former military base and outpost that was evacuated in 2005, during the maneuvers. 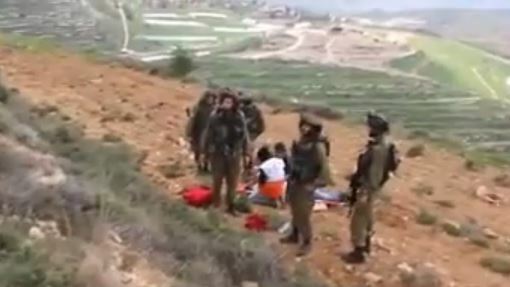 Military training was conducted in the evacuated site amid heavy presence of Israeli forces, the sources added. Israeli soldiers, stationed on military towers across the border fence with the Gaza Strip, fired on Tuesday morning, several rounds of live ammunition on homes and lands, in border areas of the coastal region, and kidnapped two Palestinians near Gaza border fence. The Maan News Agency said the soldiers fired live rounds targeting the Sheja’eyya, Zeitoun and Juhr ed-Deek areas, causing property damage. Two tried to enter Israeli to search for work, especially under the dire conditions, destruction and poverty in the besieged Gaza Strip, and were taken prisoner, just as they crossed the border fence. On Monday morning, soldiers stationed across the border fence with Gaza, fired rounds of live ammunition at Palestinian homes, and farmlands, east of Khan Younis, in the southern part of the Gaza Strip. On Saturday at dawn, Israeli navy ships opened fire on a number of fishing boats in Palestinian waters, in the Sudaniyya Sea area, northwest of Gaza City. 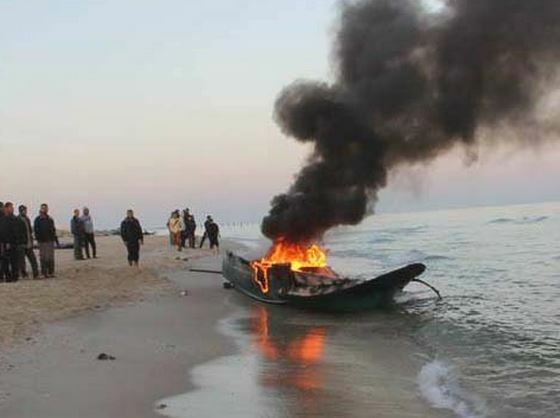 On Saturday, March 7, a fisher was killed by Israeli Navy fire in Gaza territorial waters, and two others were kidnapped. The Israeli Occupation Forces (IOF) on Monday afternoon opened machinegun fire at a Palestinian rally to the east of Gaza calling for accelerating Gaza reconstruction. The National Movement Committee for Breaking the Siege and Reconstruction organized at noon a massive rally, east of Rafah, with the participation of the owners of houses destroyed by the IOF. The rally demanded acceleration of the reconstruction process and lifting the siege on Gaza. Local sources said that Israeli soldiers, stationed east of Gaza, opened fire and tear gas intensively at the protesters and luckily, no casualties were reported except for some participants who fainted as a result of inhaling tear gas and were treated in the field. The attack is another episode in the series of Israeli daily violations of the Cairo-brokered truce accord signed in the wake of last summer’s offensive on the besieged coastal enclave, which killed over 2,300 Palestinians, mostly civilians. 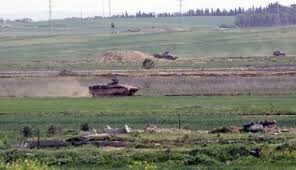 Israeli Occupation Forces (IOF) opened machinegun fire toward agricultural lands to the east of Rafah in southern Gaza Strip on Monday morning. 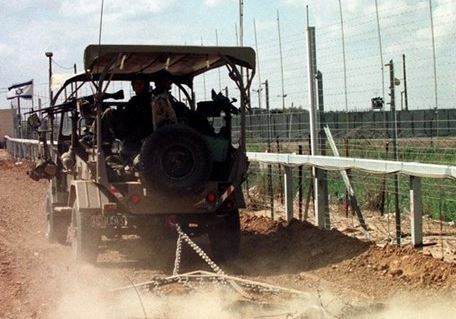 Local sources told the PIC reporter that the IOF soldiers stationed at Sofa military checkpoint, east of Rafah, fired machineguns at Palestinian farms northeast of Rafah with no casualties reported. The IOF soldiers routinely unleash indiscriminate bombing and limited incursions targeting the eastern outskirts of the blockaded enclave, breaching the ceasefire agreement signed in August, 2014 that halted last summer’s Israeli aggression on Gaza. 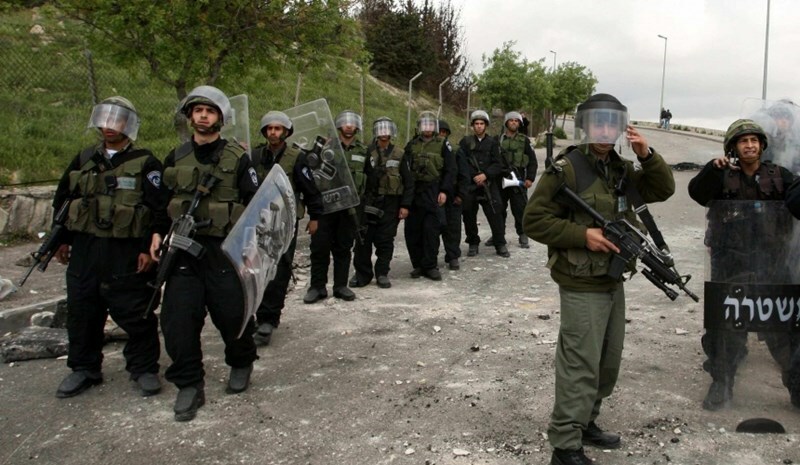 Violent clashes broke out Monday in Aroub refugee camp to the north of al-Khalil when Israeli Occupation Forces (IOF) suppressed a solidarity rally with the sick prisoner Ibrahim Jamal. 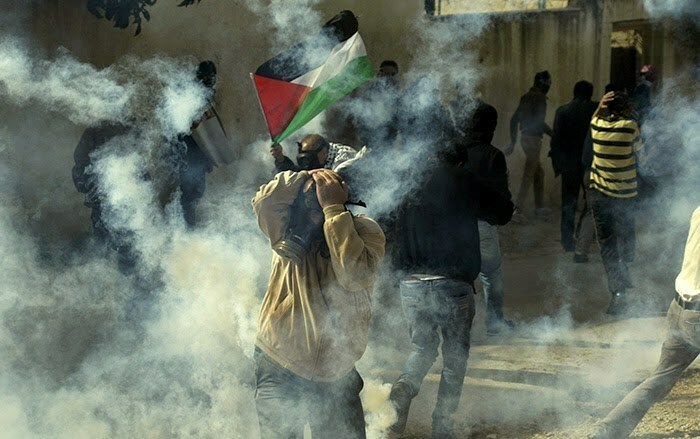 The PIC reporter quoted eyewitnesses as saying that the IOF soldiers violently stormed the refugee camp and occupied the local homes and shops’ rooftops from which they started firing heavy tear gas bombs and rubber bullets towards the participants at the solidarity rally, which led to the outbreak of the confrontations. 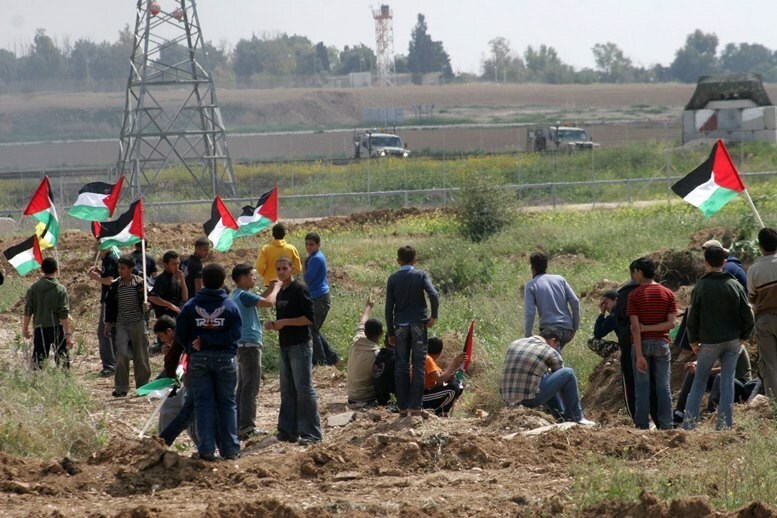 Local residents, in turn, responded by throwing stones, empty bottles, and Molotov cocktails at the invading soldiers who intensified their presence at the entrance of the refugee camp, the sources added. The Palestinian prisoner Ibrahim Jamal lost his sight and ability to speak after hitting his head on the end of the iron bed in Eshel prison. However, he did not receive any medical treatment despite being injured in the prison. Approximately 1500 Palestinian prisoners held in Israeli jails are suffering from different kinds of diseases. Some 200 of them are suffering from critical conditions. Israeli soldiers attacked, Sunday, a nonviolent activity held by dozens of Palestinians, and international peace activists, and dragged a Palestinian away after they assaulted him, causing him to faint. The Israeli military assault took place in Qaryout village, near the northern West Bank city of Nablus. Dozens of nonviolent Palestinian activists, accompanied by Israeli and international supporters, were conducting a nonviolently activity in Palestinian lands, marking the twelfth anniversary of the murder of American peace activist Rachel Corrie. A video documenting the incident, showed the soldiers preventing residents and medics from helping the fainted man, and later dragged him away without providing first aid. “You cannot take him without a medic; it's illegal… you can’t, am filming this,” a woman holding a video camera said. The soldiers started dragging the man amidst shouts of objection from the locals and international peace activists, before a soldier fired a live round up into the air, and starting ordering the residents away. Sounds of guns being cocked could be heard then, while the soldiers continued to drag the Palestinian, and continued to force the residents away, while threatening to shoot them. On March 16, 2003, Corrie, a 23-year-old American peace activist from Olympia – Washington, was crushed to death by an armored Israeli military D9 bulldozer, in Rafah, in the southern part of the Gaza Strip. She was a dedicated defender of peace, justice and equality for all, and a member of the International Solidarity Movement (ISM); Corrie was using a megaphone trying, along with many locals and peace activists, trying to prevent the soldiers from bulldozing and demolishing Palestinian homes in Rafah. Dozens of suffocation cases were reported on Sunday noon among Palestinians who took to the streets in a peaceful anti-settlement march in Qaryout town in southern Nablus. Activist Bashar al-Qaryouti told the PIC reporter that the Israeli Occupation Forces (IOF) intensively opened rubber bullets and tear gas at the marchers. The activist said the Palestinian ambulances rushed to the scene to transfer the suffocated civilians while some of them received treatment in the field. 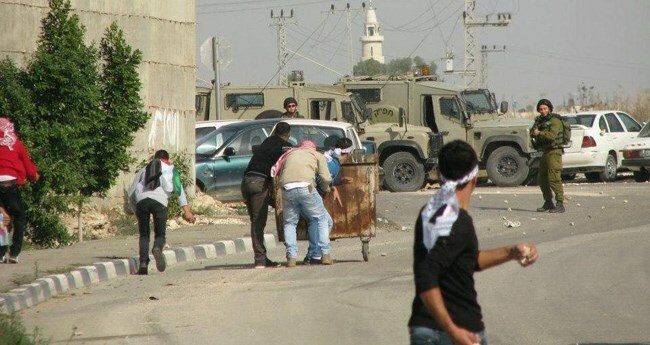 Clashes, consequently, broke out between Palestinian demonstrators and the IOF soldiers. Dozens of university students along with other activists against settlement activity took part in the march to protest the continuation of settlement building and the Israeli daily aggressive practices in the Palestinian towns. This march is part of the series of popular activities for the protection of the Palestinian lands threatened with confiscation in Qaryout town which is located near Shilo settlement. A Palestinian young man from al-Khalil was moderately injured by Israeli army shooting in Occupied Jerusalem on Sunday. Palestinian security sources told Quds Press that the 22-year-old young man Ihab Aref al-Tardah was transferred to hospital after being shot with a rubber bullet fired by the Israeli Occupation Forces (IOF) near a military checkpoint in Occupied Jerusalem. The sources disclosed that the youth was trying to cross the Israeli separation wall in order to reach his working place in the occupied city. Meanwhile, IOF soldiers stormed on Saturday night and at dawn Sunday the city of al-Khalil along with three of the nearby towns with no arrests reported, the sources said. Israeli soldiers, stationed across the border fence, fired on Monday morning rounds of live ammunition at Palestinian homes, and farmlands, east of Khan Younis, in the southern part of the Gaza Strip. 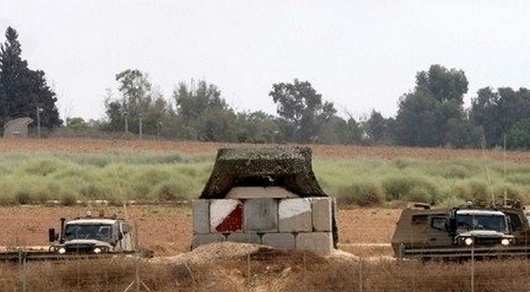 The Palestinian News & Info Agency (WAFA) has reported that the soldiers, stationed on military towers across the border, east of Khuza’a town to the east of Khan Younis, fired smoke bombs and a number of live rounds, causing property damage. WAFA added that the farmers fled their lands following the shooting; no injuries were reported. 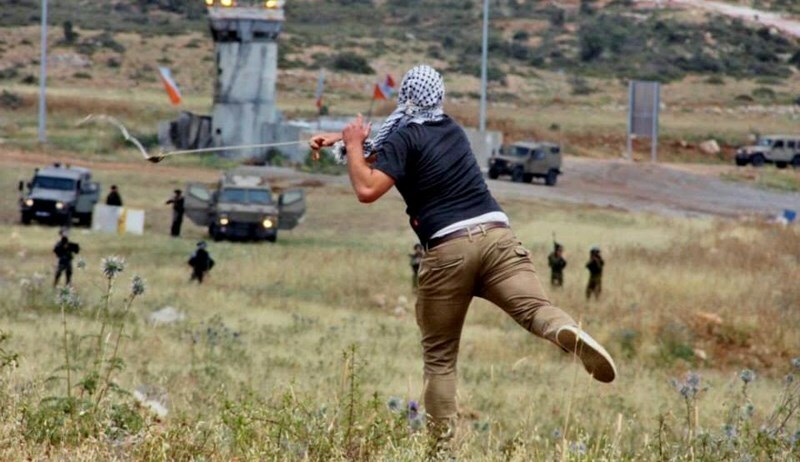 The army frequently attacks farmers and workers, in Palestinian lands and areas close to the border fence in the northern and eastern parts of the coastal region, and prevents them from entering their lands. Israeli Navy ships also frequently attack Palestinian fishing boats in Gaza territorial waters, and even while docked on shore. Besides property damage, the attacks repeatedly led to casualties and arrests of the fishers, in addition to confiscating their boats. 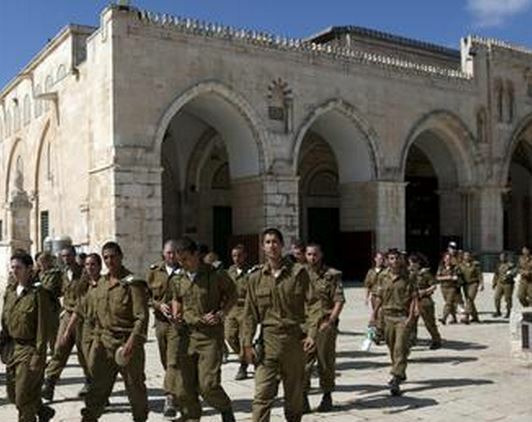 Israeli soldiers attacked, Monday, a 10-year-old Palestinian child as dozens of Israeli fanatics stormed the Al-Aqsa Mosque yards, in occupied Jerusalem, and also assaulted a mosque guard while trying to stop them. An employee with the Islamic Waqf and Endowment Department said the soldiers attacked the 10-year-old girl in the area between the al-Qibli Mosque and the al-Magharba Gate, as dozens of Israeli extremists stormed the mosque’s yards. A local mosque guard tried to stop the soldiers and prevent them from further beating the child, but they also assaulted him before dozens of worshipers gathered around the soldiers while chanting Allahu Akbar (God is the greatest). The Islamic Waqf Department denounced the latest attack, the daily Israeli invasions into the mosque quarters, and the continuous assaults against local worshipers. On Sunday, a large group of Israeli fanatics stormed the mosque quarters from the al-Magharba Gate, under heavy Israeli police and army deployment. Israel imposes numerous restrictions on the entry of Muslims into the Al-Aqsa mosque, such as imposing a minimum age for entry, withholding ID cards, and continuously besieging it in addition to closing all of it gates while extremist Israeli groups stormed the compound. The restrictions, and age limitations, differ between males and females, in addition to marital status and whether the person is a parent or not. Many Palestinians have been injured in clashes with the Israeli Occupation Forces (IOF) that broke out in Fahmeh town near Jenin on Saturday. Local sources said the IOF raided the town Saturday noon and carried out search and storming operations in different areas. The raid involved shooting of live and rubber bullets in addition to tear gas directly toward the houses. The sources pointed out that the clashes took place between IOF soldiers and the town’s youths who took to the streets to confront the Israeli provocative, aggressive practices. 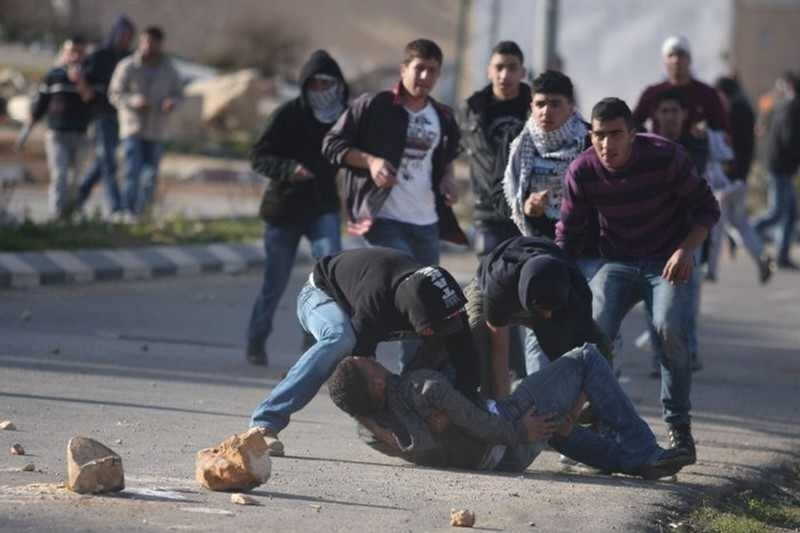 The sources noted that the clashes heated up in the town before the IOF retreated following a two-hour confrontation. The Palestinian ambulances transferred the wounded, whose injuries were described as moderate, to hospital whereas other cases were cured in the field, the sources elaborated. Israeli navy ships opened fire, on Saturday at dawn, on a number of Palestinian fishing boats in Palestinian waters, in the Sudaniyya Sea area, northwest of Gaza City. The fishers said they were less than four miles away from the Gaza shore, before the navy fired dozens of rounds of live ammunition, causing significant property damage but no injuries. The navy conducts daily attacks against the fishers in Gaza, and their boats, in an attempt to prevent them from fishing, an issue that impacts the lives of dozens of thousands of Palestinians who depend on fishing as their only sources of livelihood to their families. The attacks frequently lead to kidnapping some of the fishers, towing their boats, in addition to dozens of casualties, including fatalities. Last Saturday, March 7, a Palestinian fisher was killed by Israeli Navy fire in Gaza territorial waters, and two others were kidnapped. Two days before the attack, two fishers were shot and injured. The current six-nautical-mile fishing zone falls drastically short of the twenty nautical miles allocated to Palestinian fishermen in the 1993 Oslo Accords, and come in direct violation of every ceasefire agreement.